Consumer products that have been on the market for a long time but suddenly have new commercials and labels screaming “NEW AND IMPROVED” – usually aren’t. In reality, there’s rarely a major improvement made to successful mainstream products; marketers often play the “new and improved” card because sales are falling or a new competitor makes a splash. It’s not only consumers who have to adapt. The organizations that develop standards for electronic signal transmission must continually evaluate the landscape, in order to set new guidelines for equipment delivering and receiving the signals, and the cables that carry them. That brings us to the latest new and improved standard: HDMI 2.1. And unlike dish soap or razors, HDMI 2.1 truly is new and improved. First things first. Most of the important upgrades over HDMI 2.0 are being made with an eye to the future of digital delivery and won’t have much impact on your current home theater. Additionally, the full specs won’t be released until sometime this spring – too late to be implemented in equipment like TVs until late this year. With that in mind, here’s what will be eventually possible with HDMI 2.1. Higher resolutions: As you certainly know, state-of-the-art UltraHD TVs display a maximum resolution of 4K, or approximately eight million pixels (screen dots) of information at one time. HDMI 2.0 can handle that resolution, but not much more. HDMI 2.1 will be able to handle resolutions as high as 10K when they’re eventually feasible. That will be a while; right now, there aren’t even 8K TVs on the market. Increased bandwidth: The amount of data required to create a video display increases as display resolution increases. That means HDMI 2.0 cables won’t be able to carry all of the information necessary to show an 8K picture. HDMI 2.1 cables will alleviate that problem by more than doubling the bandwidth capacity of current cables, from 18 Gbps to 48 Gbps. 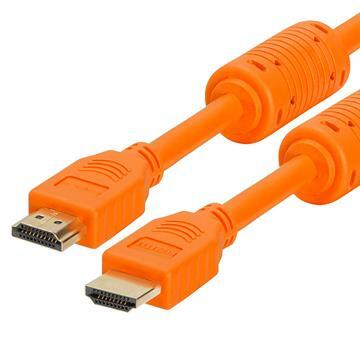 That will require larger cables, but thankfully they’ll have the same connectors as HDMI 2.0 and will be backward-compatible. Higher refresh rates: The “motion” in a TV picture is really a series of individual frames, just more technologically advanced than old-time cartoon “flip books.” The video refresh rate is the speed at which a new picture is shown and it’s traditionally been 60Hz, or 60 frames per second. Some 4K TVs can be set at a 120Hz refresh rate but that only is useful for some gamers, since today’s video sources are capable of just 60Hz. In the future, though, 8K at 60Hz and 4K at 120Hz video will be easily handled by HDMI 2.1. Is There Anything In HDMI 2.1 That’s Useful In 2017? Absolutely. The new HDMI 2.1 standard includes several features which will immediately improve the user experience for many. Dynamic HDR: HDR (high dynamic range) was a major step forward in picture quality, because it uses information from the video source to optimize detail, color and brightness for a movie or TV show. HDMI 2.1’s Dynamic HDR is an even bigger technological leap, with the display optimized for every single frame of a program to create a stunning viewing experience. Game Mode VRR: The variable refresh rate possible in the new standards will allow a 3D graphics processor to virtually eliminate video lag, both in normal game play and in virtual reality settings. Object-Based Audio: HDMI 2.1 will be able to handle the most advanced high-res audio standards, like Dolby Atmos sound. The huge innovations in HDMI 2.1 are aimed at the long-term. But once 2.1-enabled TVs and components are available, many will find that there’s immediate value to upgrading.